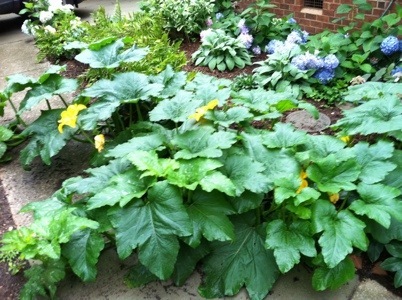 Who knew last November when I shoveled rotten pumpkin goo into my flower bed that I would be creating a monster. But a monster pumpkin plant is apparently what we have on our hands! This one plant has taken over the flower bed, the walkway and soon, the driveway. So far, it looks better than anything I actually planted on purpose and other than some compost from our bin this spring, I haven’t fertilized it or anything. 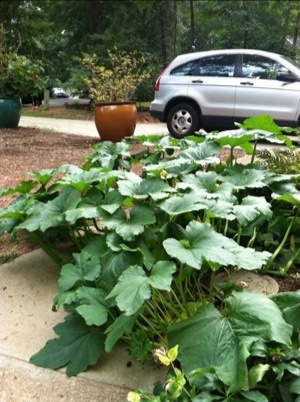 Its huge, orange flowers should be producing lil’ baby pumpkins. Should. But isn’t. Why??? Any ideas? Do I have one of those weird GMO pumpkin plants that doesn’t have fertile seeds? I wish all my intentional plants looked that lush! It’s been a fun science experiment if nothing else. Oh my goodness! You have me really wondering if this is what I’m in for! I have a blog post on a similar topic for tomorrow!